This article was turned up by the extraordinary (and sometimes extraordinarily annoying) Google Books.The pictures and text are from them in 2011 and are subject to their copyright restrictions. The “benevolent Lady” of the parish is, presumably, Lucy Monoux, although she died not long after this article was published. The Countess de Grey was Henrietta Francis, wife of the Earl De Grey, who lived at Wrest Park, Silsoe. Beds archive has a bit about her here. The version of the school proposed here, on the site of the old poor house, was never built. The school that was built, in School Lane, looks quite different. Mr. Urban, Froxfield, 4 March. 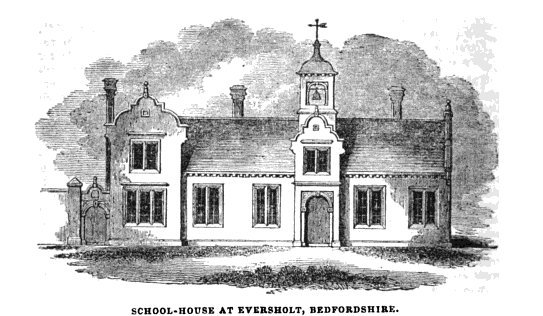 I SEND you a drawing of the building proposed to be erected in the parish of Eversholt, Bedfordshire, combining a Day-school, Infant-school, and Sunday-school. There is every reason to hope that the feoffees of the town estate will be induced to allow its being built on the ground now occupied by the poor-house, and the occupation of which is such as to be quite injurious to the moral and religious habits of the parish. The estate mentioned was left in the early part of Queen Elizabeth’s reign, and although the original intentions of the founder have not been discovered, it is very clear it was never intended by him to relieve the poor-rate, which did not exist at the time of his bequest. In the memory of many of the inhabitants there was a good and efficient school in this building; but this has long ceased to exist, and the building is appropriated in the improper manner mentioned. The want of a national school is deeply felt in the parish; but as it is for the most occupied by a rural population, little means can be expected from them towards erecting the building. The contributions of the wellwishers to a moral and religious education are most earnestly solicited. * A benevolent lady in the parish has consented that a fancy fair shall be held in her grounds in the Autumn; the Duchess of Bedford, the Countess de Grey, and Lady Charles Russell have kindly consented to patronise the scheme, and will be happy to receive the aid of your fair correspondents. Any further information will be most gladly afforded by. * These will be gratefully received by the Rector, the Rev. James Reed, or by his bankers, Messrs. Drummond.